Do you use Twitter to promote your business? Want to discover how to connect with your audience and engage on Twitter? To learn how to use Twitter for business, I interview Laura Fitton. In this episode I interview Laura Fitton, co-author of Twitter for Dummies. She’s also founded OneForty (a Twitter app store) and now she is the Inbound Marketing Evangelist at HubSpot. Laura and I will explore Twitter marketing. You’ll discover how to market yourself on Twitter, develop relationships using the platform and more. 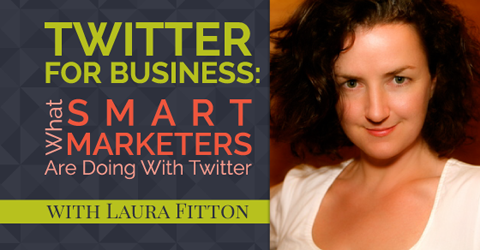 Listen as Laura Fitton shares what smart marketers are doing on Twitter. When Twitter first went big in April 2007, Laura was not immediately on board. Laura admits she even blogged about how stupid she thought Twitter was. The following month she gave it one more shot. Within 24 hours, Laura’s opinion changed. She followed a bunch of fascinating people, and saw first-hand how Twitter makes you feel connected. Laura is co-author of Twitter for Dummies. Laura feels she got the hang of it within a month, went to her first Tweetup and the beginning of June put her Twitter handle on her business cards. She thought Twitter would be big. In 2008 she reached out to Wiley Publishing because she wanted to write a book that would break down why Twitter was taking off. She never finished that proposal. She did, however, make several friends at Wiley through Twitter. She reached out to one of them and asked who to talk to about her book. They were looking for someone to write Twitter for Dummies. A match was made. 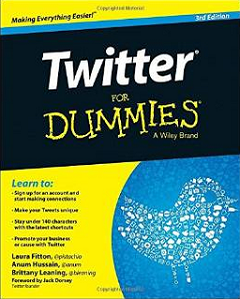 The first edition of Twitter for Dummies came out the same time Laura launched OneForty. Listen to the show to find out how Laura came up with the name for Pistachio consulting and why she used it for Twitter. Laura believes people need to center everything they do on Twitter around who they want to read it. You need to figure out who the perfect customer is for your business and what they actually need. Start by writing a Twitter mission statement on your profile that addresses who the account is for and what value it delivers. Whenever you are deciding what to tweet, see if it fits your mission. The other great thing about a mission statement, Laura adds, is that it lets others simply articulate what your account is about, who should follow it and why. The key to being successful on Twitter is sharing the right information, whether it’s your own links or other content. Laura adds that you can get away with a fair amount of self-promotion, if you provide information that helps people, especially the people who would make a good customer for you in the first place. 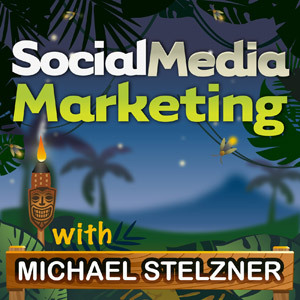 Listen to the show to hear Social Media Examiner’s Twitter mission statement. Laura shares two personal Twitter experiences. One with Canada Goose Inc and another with Verizon. In both cases she had a specific customer-service need. With Verizon, she had a wire down on her street. With Canada Goose Inc she had an order for a hard-to-find jacket cancel out. In both cases she said on Twitter.“Hey @company. I have some questions. Could you follow me back?” Note: After a company follows you, you can send private messages. If you send @reply, it will show up on the mentions tab. It’s better to have them follow you, so you can message them. Once connected privately, Laura told Verizon about the down line, explained that she got no action through regular channels and asked them to kindly check it out. In the case of Canada Goose, they went above and beyond, and found the coat for her. Laura also shares her great experiences with @MINIUSA and @PeapodDelivers. 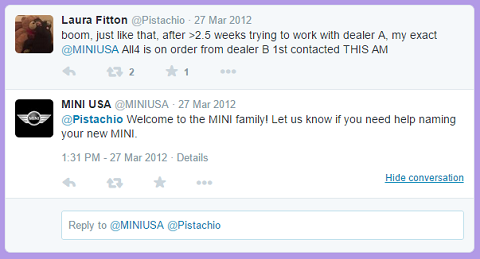 @MiniUSA gave Laura (@Pistachio) and her new Mini a warm welcome via Twitter. Laura also lists some Twitter accounts that do a great job with their mission statement: Goldman Sachs, Travelocity, Kate Spade New York, PlayStation Europe, Machinima, SitePoint, Refinery29 and Alternative Press. They all have bios that say, “Follow us for…” and say exactly what you’re going to get by following the account. Listen to the show to learn how businesses can use Twitter to improve their customer service. Laura explains several things people can do to develop relationships with others on Twitter. For example, she says, when you share something that someone else wrote, don’t just tell people why it’s great and share the link, also include the Twitter handle of the author. This will get you right on their radar as someone who supports and appreciates their work. That’s the first step to building a relationship. Also, if someone writes about you, @mention them when you share the link. This is especially important if you have a good following that will also retweet and engage with the article. Journalists need to write content that gets attention and engagement. However, this also applies to other areas: @mention employees you are trying to attract to your company, partners you’re trying to work with and ideal customers. Before you reach out to anybody on Twitter, Laura’s suggestion is to first follow them. By following, you play a wait and see game; see how you can add value to the things they tweet. Laura says, a lot of people ask questions on Twitter. Be one of the people who answers other people’s questions. A lot of people tweet about stuff they love. Respond that you love it too, but only when it’s authentic. Listen to the show to hear Laura’s response and caution to a Wall Street Journal reporter who was installing a new app. Over the years, Laura says she’s gone through many different Twitter phases: the 50-tweets-a-day phase, goofy over-sharing phase, “I’m so excited about everything I’ve ever seen” phase and more. Lately, Laura mostly uses Twitter to follow up and respond to others. Laura has a list of people she follows and reads regularly. “It’s a great way to pick up a lot of information fast on a break,” she explains. One method she suggests is working for 45 minutes, taking a walk for 5 and catching up on Twitter for 10. Then, dive back into your next hour of work. 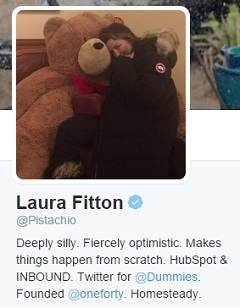 In addition to replies, Laura tweets things like quotes and Hubspot articles. The tweet pinned to the top of her account is an Elizabeth Gilbert quote that resonated with her. Laura likes using pinned tweets. Listen to the show to discover why people should use more images on Twitter. 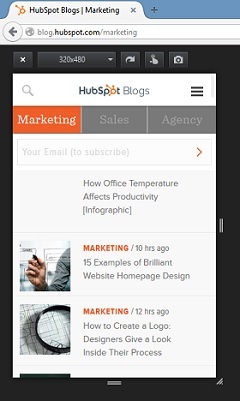 For example, if you are on a Mac, hold down Cmd+Opt+M to see how your site looks on mobile. Windows users, hold down Ctrl+Shift+M. It shows you how your website looks in a mobile responsive environment. For the real geeks, another cool capability is Cmd+Opt+Q (Mac) or Ctrl+Shift+Q (Windows). This allows you to see how your webpage loads and what is slowing it down. This is great way to test and troubleshoot your website. Listen to the show to learn more and let us know how these Firefox tricks work for you. In the show, Laura Fitton talks about her experience at Social Media Marketing World, including the cool things she learned at the opening night party on the USS Midway. You’ll also hear from Martin Shervington. At the conference, Martin will be talking about Google+ and how you can use it for your business and to grow your community. Martin is the world’s leading G+ expert and is coming from Australia to the conference. If you live in another country, don’t let distance stop you. We have people coming from more than 30 countries, including Australia, the Netherlands, United Arab Emirates, South Africa, India, Japan, France, New Zealand, Israel, Panama, Nigeria, the United Kingdom and more. Take your social media marketing to the next level and join us in warm, sunny, beautiful San Diego, California on March 25, 26 and 27, 2015. Hundreds of people have already secured their tickets. Click here to check out all of the speakers and the agenda, watch our video and grab your early bird discount today. Connect with Laura on HubSpot. Check out What Would Google Do? by Jeff Jarvis. Explore mission statements from @GoldmanSachs, @travelocity, @katespadeny, @PlayStationEU, @Machinima, @sitepointdotcom, @Refinery29 and @AltPress. Check out shortcuts for Firefox. What do you think? What are your thoughts on Twitter for business? Please leave your comments below.